Getting your pontoon boat on and off the water used to be an expensive proposition. 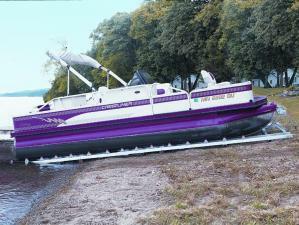 Roll-n-Go's patented roller ramp shore dock handles pontoon boat s up to 2000 lbs. with 18" to 26" (round only) pontoon diameters. Includes 52 polyurethane donut style rollers, which mount anywhere along the rails. Also available are complete 9 foot add-on sections. The standard 1700-lb. winch with 25' strap is upgradeable to a 1500 lb. self-braking winch with 50' cable. includes ground anchoring system. 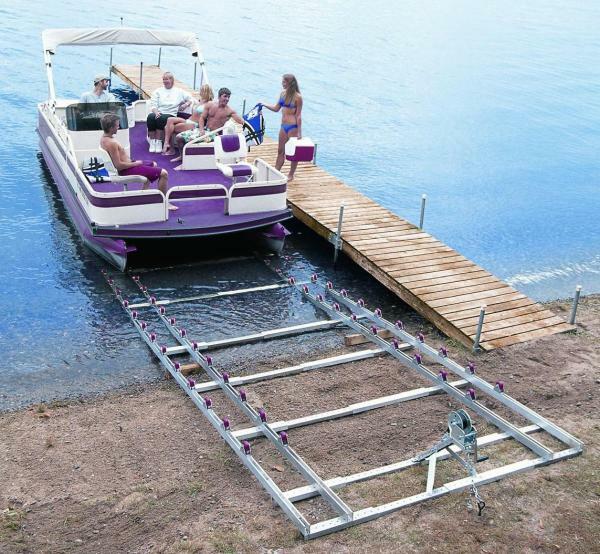 To use, simply pull your pontoon boat up to the Roll-n-Go roller ramp shore dock, hook on the strap and crank it up to easily get off the water. Rails adjust from 66" to 82" on-center pontoon separation. Quality, zinc plated winch for effortless cranking. Welded aluminum construction and stainless steel fasteners ensure years of durable, worry free use. High quality polyurethane "donut" style rollers for smooth operation. The Roll-n-Go pontoon boat shore dock weighs 250 lbs and can be disassembled into sections for easy storage over the winter. Optional, 9 ft. long extensions and supports are available for applications where a longer ramp is needed. Optional, 1,500 lb. self braking winch available for steeper applications. MAX. WEIGHT CAPACITY 2000 lbs. OVERALL WIDTH Adjustable for round pontoons spaced between 66" and 82"
RAIL WIDTH Adjustable for round pontoons spaced between 66" and 82"
ADD-ON SECTIONS Available 8' 11"